Don’t you just love receiving homemade holiday gifts? It’s even more fun to give a homemade gift, than it is to receive one. I’m pretty certain that my neighbors look forward to getting a tin filled of Christmas cookies each December. I have a fun diy gift idea for you that is sure to be enjoyed by family and friends. 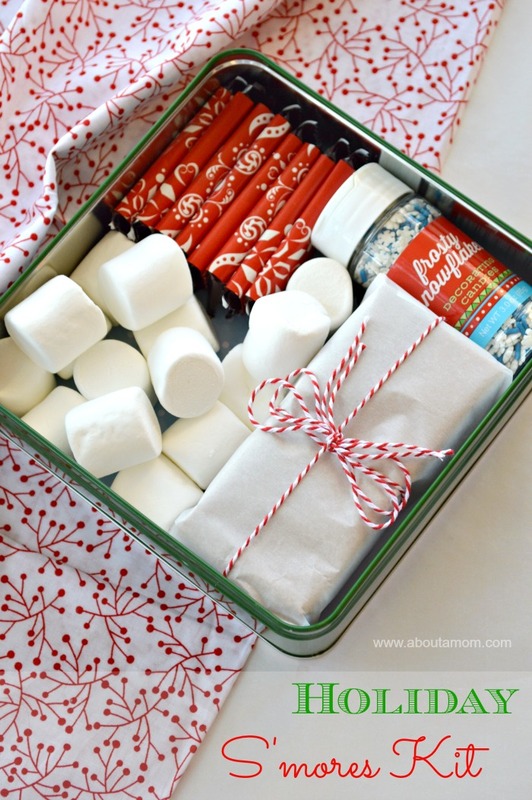 This Holiday S’mores Kit was is simple to assemble, and I think it turned out super cute! 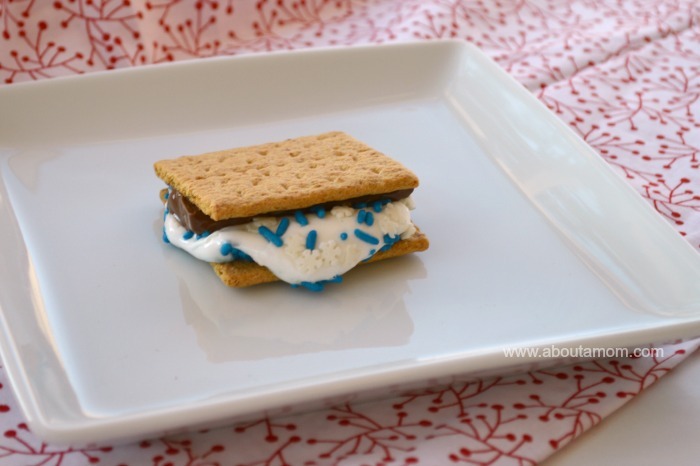 This holiday s’mores kit is so simple to make and is something anyone could enjoy. You could even jot the recipe down on a card and accompany the directions with your s’mores kits. Heat oven to 350°F. Place the graham squares in single layer on baking sheet. One at a time, dip marshmallows in water; gently shake off excess water and roll marshmallows in sprinkles. Place a marshmallow onto half of your graham squares. (You should have an equal number of marshmallow topped graham squares and plain graham squares.) Bake 2 to 3 min. or until marshmallows are puffed. Immediately place 1 chocolate piece on each plain graham square. Sandwich chocolate and marshmallow-topped squares to make s’mores; press together gently to secure. Enjoy! Cut the wrapping paper into rectangle pieces to wrap around the candy bars. Wrap and secure with a piece of tape. (Optionally, wrap the graham crackers in a piece of parchment paper.) Wrap the package of graham crackers in a bit of bakers twine. This is just to pretty it up, of course. Arrange the candy bars, graham crackers, marshmallows and sprinkles in the tin in a way that is pleasing to the eye. I think this is such a fun gift to give to a family. It’s a something everyone can enjoy! Are you making any homemade holiday gifts this year? Heat oven to 350°F. Place the graham squares in single layer on baking sheet. One at a time, dip marshmallows in water; gently shake off excess water and roll marshmallows in sprinkles. Place a marshmallow onto half of your graham squares. (You should have an equal number of marshmallow topped graham squares and plain graham squares.) Bake 2 to 3 min. or until marshmallows are puffed. Immediately place 1 chocolate piece on each plain graham square. Sandwich chocolate and marshmallow-topped squares to make s'mores; press together gently to secure. Enjoy! Celebrate National S’mores Day with S’mores on a Stick! I have never tried baking smores. It has got to be a lot easier than doing them over a campfire. This is a cute gift idea. A s’more kit is a GREAT idea!! I don’t know why I didn’t think of that lol We love s’mores! Who doesn’t love s’mores?! That’s a great gift idea. This is such a great idea. I bet it would make a great gift for kids as well. What a cute idea. AND that instantly made me want s’mores. Ah, the power of suggestion. Oh my gosh, this is so cute! I absolutely love s’mores. I might have to send this to my best friend and tell her to make me one!! I’d love to give these out to my neighbors. This is a great gift package! Holy smokes! What a cool idea. In fact, you can give it to anyone… any age. Everybody loves smores. I have to dash to Walmart and get a few of these things I think I’ll be able to say I’m almost done with my Christmas shopping. Woo Hoo Thanks for sharing and for the idea! I love it and will put it to copy use! You know, it’s my ambition to put one of these kits together – I say that I will every year and I never get to it! I love the sprinkles in your kit!! I absolutely love home made gifts… anything someone puts together reflects their craftiness and originality. I love this idea! I love giving and receiving homemade gifts. They’re so much more thoughtful! This one looks so adorable, and delicious. That’s such a great idea. Love the presentation in the box! That is ADORABLE!!! It could even work for a cookie exchange!! I can’t get enough s’mores! What a clever idea! I love smores and we make them for our fall festival (and any other time I can make an excuse to make them). What a great gift idea. This is such a great idea! Who doesn’t love S’mores?! What a cute idea! I wish someone would give me this kit by this weekend because we are going camping! What a great idea! This would make for an awesome gift for family. Very cute idea! Love it and pinned it! That is adorable. I can think of a few people that would really enjoy getting this as a gift this year. What an amazing idea! This would be a great gift, I know so many people who would love it! This is such a cute idea! I need to do this for my friends and family! Such a cute idea, to get a smores is adorable! Such an adorable thing to do; I could use a smores kit myself! That’s such a great idea for a gift! I love DIY gifts and this is definitely something I’m going to have to try next year. This is a perfect Smores Kit. I will have to make up a few kits for gifts. My kids will love it. This is a great gift idea. Who does not like Smores. What an adorable idea! I will be making these with my kids. This is awesome. I am pretty sure kiddo would like it if someone gave her this for Christmas. She loves smores. This is such a cute idea! i love the colorful sprinkles. This is a really thoughtful, cute, and yummy gift idea! What a great idea! Who would have thought to give a smores kit? I love this! I love your idea for the s’mores kit! Pinning! This is such a cute kit. There is nothing I lover better than smores so this would work for me. What a clever idea for the person who loves S’Mores!! Thank you for sharing and Happy New Year! Nice Idea I love smore’s and the sprinkles are a neat Idea. This is such a clever idea for DIY gifts for the holidays! Thank you For sharing! What a cute gift! I know a lot of people that would love a gift like this. I love how the Smores look for the Holidays. I will have to make these for Valentine’s Day! This is a super clever idea and one that I think I will do this year. This is a great take on gifts from the kitchen. I love the way everything is packaged. 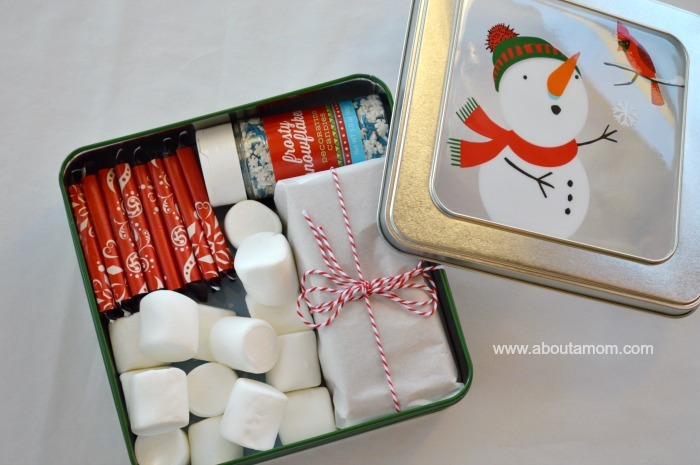 I have lots of cute tins and now I know what to do with them make this gift for my family and friends they will love it.